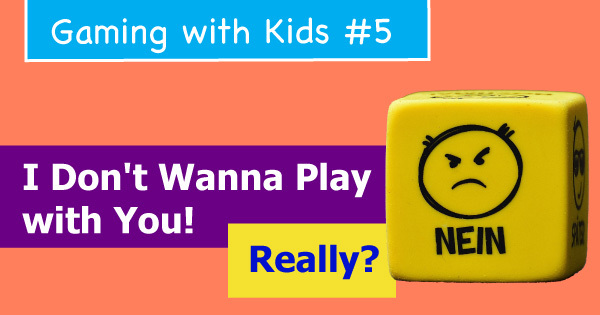 Raku On The Board: Gaming with Kids #5: I Don't Wanna Play with You! Really? Gaming with Kids #5: I Don't Wanna Play with You! Really? My children have so many cool things to do. Drawing, playing on tablets or consoles, watching movies, and they got a big room filled up with toys. Sometimes board games are not their number one choice, and I respect that. Often when I offer them a lovely board game evening, they will just say "NO". Especially Key Stage 2 children. And that's OK. But does it really mean they don't want to play? Do you have the same problem with your children? First, and most critical step is to answer the question why your kids don't want to play board games with you at the moment? I made a little self-check list to help you in that task! So why they say "No"? Resistance in our children is healthy and essential. It helps to keep our kids safe, and it is vital in their personal development. If they are not going too far, it's important to accept and respect their choices in this case. If this is an issue, after you show them your acceptance, they may want to play. And that's OK. They have right to do something else. They even might not realise that they are missing loads of fun. There's nothing better in the world than playing board games with you, right? However, don't be surprised when they change their mind. By now you should know what kind of games are enjoyable for your kids. But if you are new to board games you might have boring ones in your collection! Do some research and get different types of board games. For example, my children love engine builders and worker placement. Maybe it sounds cruel, but it might be the case. Look closer how do you play board games with your little ones. Look at the questions below, and if you answer "yes" to one of them, you might find a reason why your children say "no". And it might be a good idea to work on yourself. - crazy about your game? - not allowing them to touch the game? - not allowing them to help cleaning up after you finish? - not helping your children to make their best moves? - not congratulating your kids? - bored when it's their turn? Maybe they don't want to play just today, or they feel tired. It happens! Let them do something else. They don't have to play board games every time you want, right? Sit down with your partner or anyone else who's happy to join in and start setting up and play a game! Show that you enjoy it, even if your children are not playing. Sometimes when I do so with my kids, they will come around and look how we play and/or ask to join. It's normal that children are curious why adults have such good fun. Sometimes it works, and sometimes it doesn't. Anyway, give it a try! Do your children like playing board games? How often they say "NO" and what is your advice? Let's share our experiences!